Director Sergei Loznitsa’s methodical observational technique seems to be a clear signal that you shouldn’t come anywhere near Maidan if you’re expecting an action-packed account of Ukraine’s 2014 revolt against the Russian takeover of their country. But it is precisely the slow burn of his static camera that creates the atmosphere of intense and approaching calamity, and the inescapable sense that you are watching a modern history of resistance being written before your eyes. Maidan is both the name of the citizen’s uprising and Kiev’s central square, the primary location of the occupation and the stand-off with government-controlled police. This also serves as the spatial operating theater of Loznitsa’s point-of-view, beginning with a crowd of demonstrators singing the national anthem and ending with the fires, smoke, and detritus of the aftermath of the siege. In between, the film presents the architecture of preparation, protest and confrontation, beginning with quiet wide shots of people entering and exiting halls and cafeterias, doling out food and water and first aid supplies, and then, without fanfare (and decidedly without any emotion-grabbing music), we see palettes and tires being stacked in the maidan. Slowly, inexorably, tensions rise. Gas masks are donned, Molotov cocktails are thrown, snipers take to rooftops, shots are fired, explosions and conflagrations ensue. The camera tries–and fails–to remain fixed on its tripod. Inevitably, it must be picked up and moved, or awkwardly panned, when the events spiral out of Loznitsa’s frame. But it stays confidently in the center of things. The director’s fondness for long takes is put to the test, yet it is in the ebb and flow of real time that our uninterrupted gaze can appreciate both the danger and the commitment of the activist crowd. The audio consists entirely of natural sound and the intermittent announcements and speeches from unseen protest leaders. These serve as occasional time stamps of the occupation which, along with a few intertitles, provide the only exposition in a bracingly talking head-free experience. To be sure, Loznitsa’s hands-off approach leaves many questions unanswered, including the crimes of Ukraine’s president Viktor Yanukovych’s puppet regime, the scope of the uprising, the controversial, instigating role of Ukraine’s far right agitators in the battle with police and their possible culpability in the sniper deaths of protestors, and the involvement–or lack thereof–of the United States. 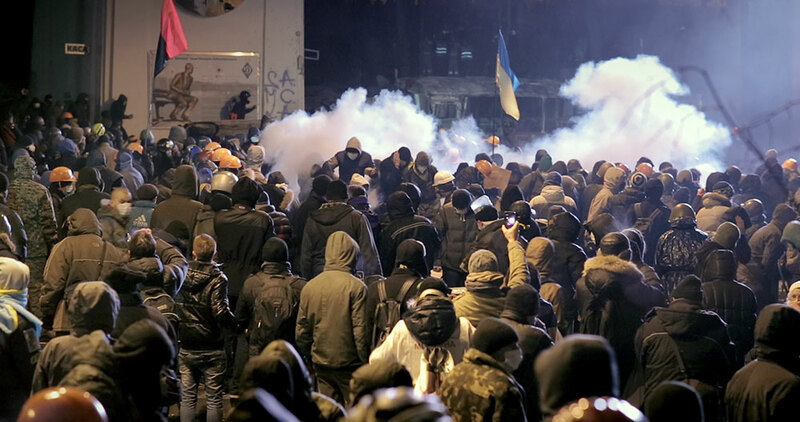 It continues to be a difficult and confusing period in Ukraine, and Maidan doesn’t exactly clear things up. But as a portrait of a collective resistance, the film’s cold-eyed, unwavering stare is invigorating. It presents American viewers with a question we may soon be forced to confront, given our own Russian-installed president: are we prepared to die for our freedom?